Increasingly businesses and brands are using animation to communicate with their audiences in a wide variety of ways. Gone are the days when it was only being used in marketing and advertising campaigns, it is now also being used to great effect in training and corporate communications too. Some of this content is nothing short of spectacular. In a bid to cut through the clutter, the best animation production companies are really pushing the boundaries of what is possible with this content. The results are truly captivating. At Skeleton, we are hugely passionate about business animation, so we’ve collected nine of our favourites, which we think show off the fantastic capabilities of 2D and 3D animation for business. MyRewards wanted a business animation….to advertise their service for businesses! The MyRewards app allows small business owners to set us loyalty schemes for their customers, in order to help them grow. What makes this animation so inventive is the way in which it shows businesses growing. Morphing a tiny coffee cart into a full-blown coffee shop isn’t exactly easy to recreate in live action video, so working with digital animation companies makes this a whole lot easier. The animation in this video is simple - which ties in nicely with the app, which is simple to use. It also reflects the app itself, building a connection for the viewer between the business animation and the app. Another tool for businesses, App Institute provides a platform for companies to build their own apps. The animation here is ideal for simplifying the app down into its main components - easy to use, modular options for your business. It also allows the app to extend beyond the smartphone, making messages and notifications literally pop out of the screen! Cadbury’s worked with a 3D animation business to promote their new range of snacks, ‘JoyFills’. They opted for a business animation which nearly didn’t relate at all to the snacks or how they are made, but more about how they can make you feel when you eat them. The 3D graphics, combined with CGI renders of the ‘JoyFills’ snacks make for a really fun video, transporting the characters from their sofa to a rollercoaster MADE of the JoyFills! You can see clearly why they decided to go for a 3D approach, as working with a 3D animation business is a bit easier than building a full-scale rollercoaster made up of biscuits and chocolate. The title of this ad for Opus’s banking services, ‘Keep Moving’, really embodies how this business animation flows. Opus used a 3D business animation to represent how they can always keep you moving when you need to pay by cash. They use a circle, which is a key element of their logo, to represent the journey the money makes from account to account, and use the circle to seamlessly transition from scene to scene. Cryptocurrency isn’t the easiest thing to explain...and it doesn’t help that you can’t physically see it. Iagon sought out digital animation companies in order to demonstrate their virtual crypto hub. This business animation reflects the entirely digital nature of cryptocurrency and blockchain by giving some parts of the animation a pixelated, nearly videogame-esque appearance. In addition to this, the app itself works as a supercomputer, but as there is no physical computer we can reference, this is animated instead, giving us the impression of a massive computer which, in reality, doesn’t exist. 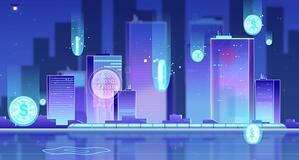 What is inventive about this business animation is that the use of colour, sound and animation style all work together in a way which is not only beautiful to look at (we’re huge fans of the blue-pink-purple combo!) but also simplifies a very complex idea and service. Iagon perfectly encapsulates multiple reasons why you should make sure you’re working with the best animation production companies, as the results are stunning! Sometimes, you need a business animation which can target a completely different demographic to your regular customers. Western Power wanted to produce a public service announcement style video to advise children on how to act when around electricity. The video took on the style of a children's cartoon, with fun sound effects and music to help engage a younger audience. The use of animation also means you can visualise electricity, which for the most part, can’t be seen. This helps children understand that just because you can’t see, hear or smell it, doesn't mean that it isn't dangerous. X5 Retail Group is a Russian food retailer. They wanted to convey how seamlessly they deliver food from warehouse to supermarkets, without just filming their trucks driving from one place to another. The clear solution was to work with a 3D animation business to create something which would more accurately demonstrate their process. Working in 3D animation allowed them to give all their lorries a uniform look, have them move in time with the music, and to integrate the brand’s colours throughout their business animation. This animation shows how inventive companies can get when it comes to portraying their everyday operations - it can be enhanced and made exciting by animating it to music and giving the process fluidity! This silent video was used in a social media campaign by Amex, to show how a loan from them can impact your business. The inventive style of this business animation makes you want to actually interact with the bar yourself, to see how different amounts of money affect the little (or big!) pizza restaurant. The animation itself is very satisfying, and it’s a fantastic way to represent the impact of different sizes of loans that AMEX offer. IATA offers an app which helps you track business expenses. Their promotional content for the app needed to be simple and sleek, to replicate the look of their app. They worked with one of the UK’s best digital animation companies (if we do say so ourselves, and we certainly do!) to create a business animation to explain how their app works. What makes this animation inventive is the flow of the video - the pace is always fast and keeps you engaged, but not so fast that you can’t figure out what is happening. It does a great job of depicting the daily struggles you run into trying to keep track of all your business receipts...then finding time to log them…then the office dog eats one...and so on. By applying animation to these everyday expense encounters, IATA could include an assortment of business costs without needing to go to each location to film. Business animation is an excellent addition to any business, and the more inventive, the better! It’s especially good for communicating complex ideas about your business or product, or to visualise something which can’t be seen by the human eye. Animation as a whole is great for just about any way you can think to use it for your business, as you can see from the examples above!